WBC AUCTION PRE-REGISTRATION NOW OPEN: BPA is now accepting pre-registration of lots for its annual WBC game auction in Lancaster, PA on August 5th. Items must be delivered in person on Monday night,August 4th or the following Tuesday morning before noon by registered members. Since the auction is very popular and lots are limited to the first 550 registered, pre-registration of items for the auction is highly recommended. Our previous auctions have sold out via pre-registration so don't expect to bring items unregistered to the door. Check out the details at http://www.boardgamers.org/wbc/auction.htm. Download your Lot Forms now. Don't procrastinate! An updated list of items made available for sale will be posted in the weeks preceding the convention. NEW IN 2008: WBC AUCTION STORE PRE-REGISTRATION REQUIRED: We've expanded our popular Auction Store for the sale of additional lower priced items during the WBC auction. Located in the same showroom with the Auction, buyers will be able to peruse items with a set price within view and earshot of the auction. The Auction Store allows us to increase the number of items handled in less time while offering sellers a more efficient way to offer lower priced items at a reduced commission. Items in the Auction Store have a top price of $30 BUT MUST be pre-registered by July 27th. You need not prepay any fees until you deliver your items to the Auction Store but the items MUST BE preregistered. Come prepared with your Auction Store Item forms pre-completed. After processing the submission, the Auction Store Administrator will provide Lot Numbers for the items. 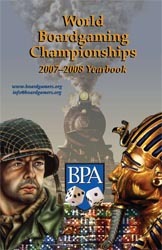 See http://www.boardgamers.org/wbc/auctionstore.htm for details and to download your Auction Store forms. Sellers are encouraged to read both the Auction and Auction Store details carefully to determine which venue is the best choice for their sales items. WBC PRE-REGISTRATION FORMS: The current Pre-Reg form can be downloaded from http://www.boardgamers.org/wbc/publicity.htm You will also soon be able to check this page to check your current registration status or to advertise for rides, roommates, or Open gaming opportunities. A limited number of 2007/2008 Yearbooks will be available for $10 each while supplies last. See the pre-registration form for ordering information. Late joining Tribune members may also pick up a copy at registration. WBC SOUVENIR T-SHIRTS: This year WBC returns to the often requested, original high quality, silk-screened shirts featuring the BPA logo of yesteryear. We no longer will be making shirts on site so if you'd like a souvenir shirt, you need to pre-order it for pickup at the show. See the pre-registration form at http://www.boardgamers.org/wbc/publicity.htm for details. OPEN GAMING & MONSTER GAMES: As part of the increased Open Gaming space at WBC, we are opening a small room for the exclusive play of large multi-map, multi-day simulation games. This would be reserved for games that can't be played in a day and need to remain setup from day to day. Players would still be required to "play" the games on a regular basis but could leave it unattended for a reasonable period without fear of it being moved. Use of the room would be on a reservation system, first come, first served. To apply, contact doncon99@toad.net with the game name. table space dimensions required, dates to be played, and the names of those who have committed to playing. This service is free to members of the conference. Other Open Gaming will be designated in two separate locations. Multi-player gaming will take place in the Lancaster Room near Heritage behind the front desk. Two-player Open Gaming will occur in Vista C & D adjacent to Vista's restaurant. Consequently, we ask everyone's co-operation in keeping the noise to a minimum for the restaurant patrons lest we lose this space in the future. 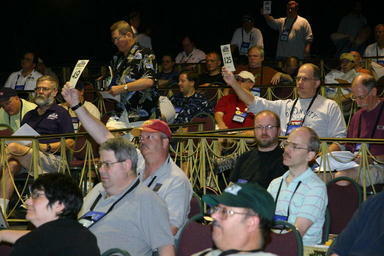 BOARD OF DIRECTORS 2008 ELECTION: The E-Ballot for the 2007 Board of Director's election is now available at http://www.boardgamers.org/election.htm. Please take a moment to cast your vote sometime before the July 15th deadline. Even if you're indifferent to the results, by law a % of the membership must caste ballots for a valid election. Failure to do so, will require an additional election at more expense which will ultimately be passed on to the membership. While ballots can be caste by mail or email also, this year the technology has been updated to facilitate true on-line voting for the ultimate in convenience at http://www.boardgamers.org/forms/BoardBallot.shtml. BPA MAILING LIST: If you want to be added to our mailing list for our Annual mailing of the WBC Pre-Reg form, send your postal address to doncon99@toad.net. Conversely, if you want off the list to "go green" to save the planet either because you'll never attend WBC or can get all the relevant info you need on line, drop us a note at the same address with the Subject "REMOVE" and your real (not on-line) name. Speaking of War At Sea, no WBC event has been more hotly contested nor lovingly celebrated in detailed coverage, statistical and otherwise thanks to longtime GM Vince Meconi. For a copy of his annual e-mail newsletter pertaining to THE tournament, jusk ask at vmeconi@verizon.net.